Welcome to the day after Christmas, aka Game Day! 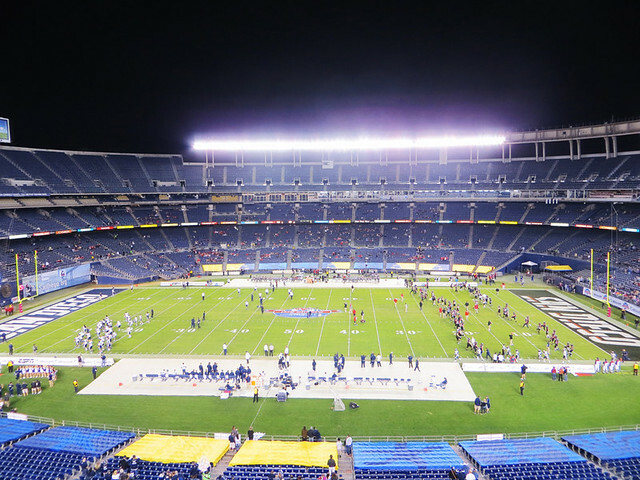 Even though the game wasn’t until that evening, the band had to load up around 2:30 to head to Qualcomm Stadium—home of the San Diego Chargers. 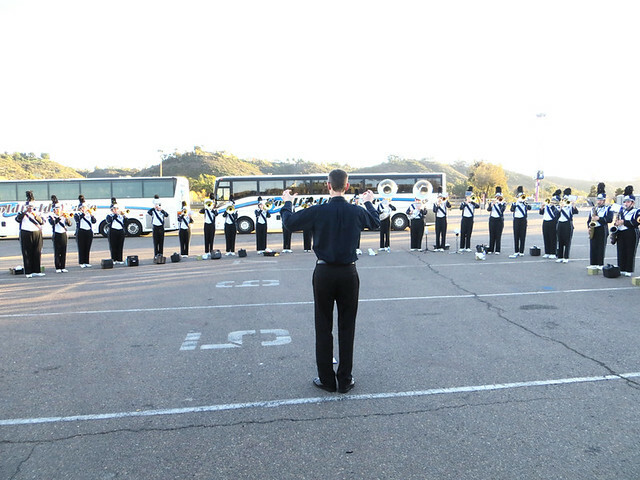 Upon arrival, the band unpacked and did a quick warm up around the bus area. 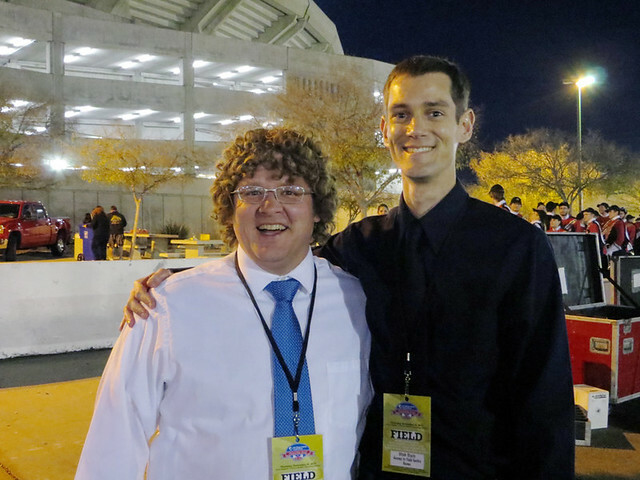 The band was scheduled to perform at several tailgating events, hence the need to be there so early. 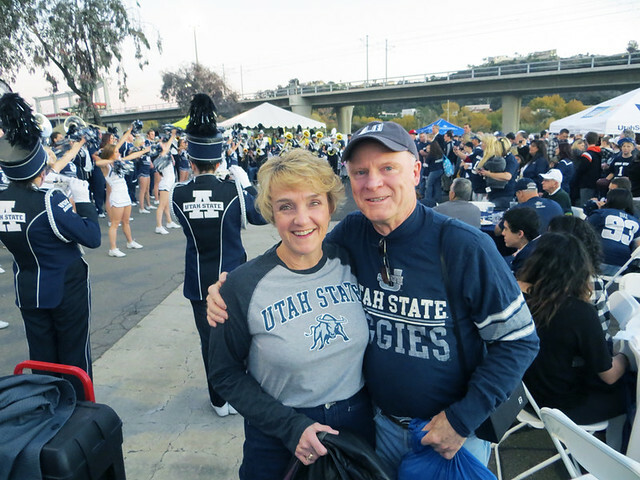 The first stop was at the official USU/USU alumni tailgate. 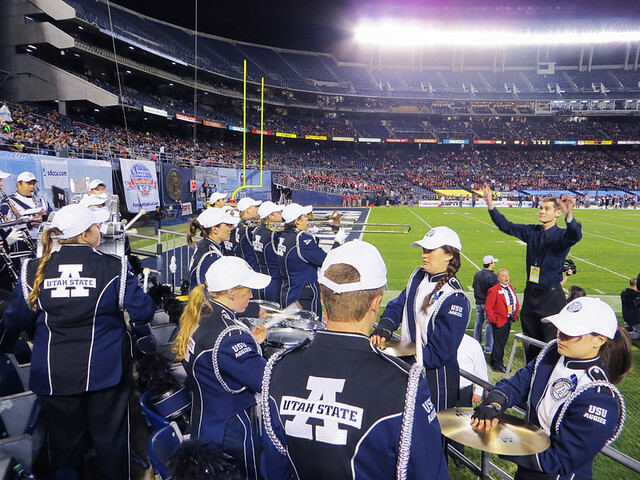 The band was joined by the cheer and dance squads and the area was packed with Aggie fans. The President of the University gave a speech, thanking Joe and the band—which was nice, and we even met up with these fans, whose shirts got them past the gate. 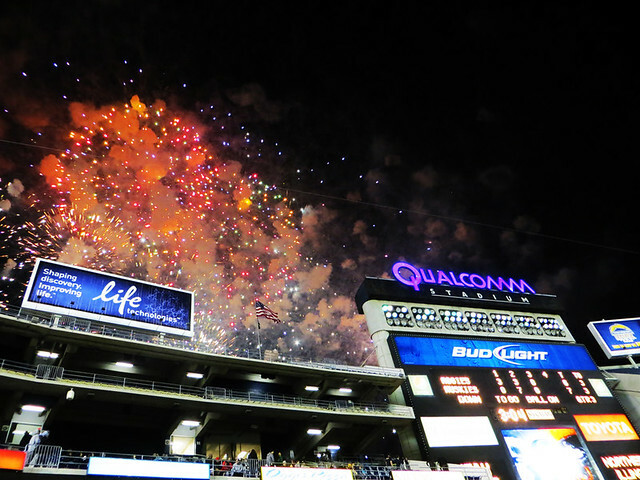 The next two tailgate stops were for a VIP dinner/party and another party honoring the Make-A-Wish Foundation. That one was my favorite, seeing all these little kids jumping and clapping with the band. So sweet. After those performances, we only had a few minutes before needing to be in the stadium for their pre-game performance, so they stopped for a quick break and I was able to snap this photo of the Aggie Band’s fearless leaders. My job was to film their pre-game and halftime performances, so I don’t have any actual photos of those, but I did take this one of my perch in the press box area. I think Joe will eventually post the videos to the Aggie Band’s Facebook page, if you’re interested in seeing them. Back in the stands, I found a seat across from the band, where I sat with 7-8 guys who coach middle school football leagues together. 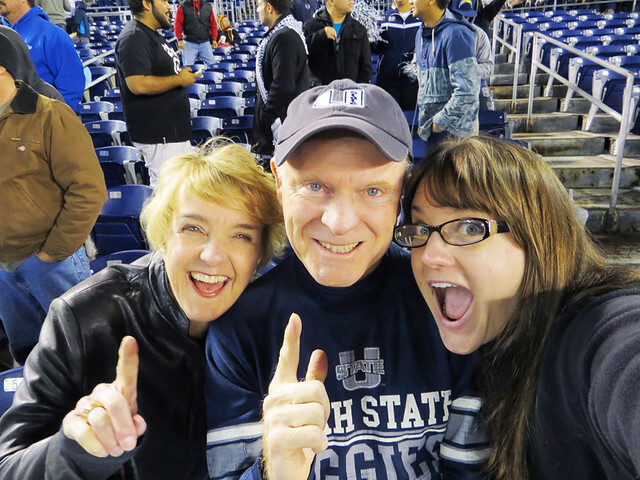 They were hilarious and managed to get ESPN’s crew to film us waving and yelling for USU. 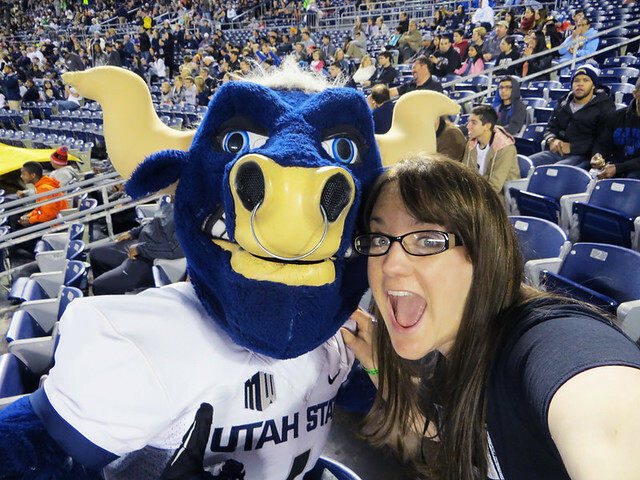 They grilled me on Utah weather, Utah sports (uh…), USU’s football season record (uh…..), and we even had a few minutes to hang with the USU mascot, Big Blue. This is my “game face.” It’ll come back throughout the night. Probably one of the most memorable events of the night came when one of the percussionists noticed her band hat was stolen in the stands. There were a lot of drunk people near her in the aisle at the end of the game, so we knew someone must have thought it was funny to swipe it. We ended up running into the thief in the parking lot….completely drunk and stumbling around. While trying to convince me and Sam that her nephew was in the band, Joe walked up behind her and grabbed the hat out of her hand. Luckily she was too intoxicated to do anything crazy, other than tell Joe he was a few choice words. No harm done, to us or the hat. We hung out for a while at the hotel after the game, before needing to repack our suitcases and get a little sleep before climbing back on that bus in the morning. Not a bad way to spend 48 hours in SoCal, or Christmas, for that matter.